Wauseon’s Macee Schang (23) defends in the lane during Saturday’s game versus Tinora. The Indians fell to the Rams, 48-46. In his debut as the Wauseon girls basketball coach, all Dan Seiler wanted was a chance to win the game at the end. He got his wish, but Wauseon’s chance was turned away as the Indians missed a last-second shot in falling to Tinora 48-46 in the season opener Saturday night. Tinora took the lead for good with 21 seconds to go when Sarah Harris drilled her fifth and final triple in the contest. The Rams followed the play with a timeout to set their defense. Wauseon brought the ball into the frontcourt, then used a timeout with 7.8 seconds left to set a final play up. However, nothing worked as the Rams were able to swat away everything in the lane in the final moments to preserve the win. The Indians were able to battle back after Tinora hit five shots from long range in the opening frame. Back-to-back treys from Harris put the Rams in front 17-8 with just under two minutes to go in the opening stanza. 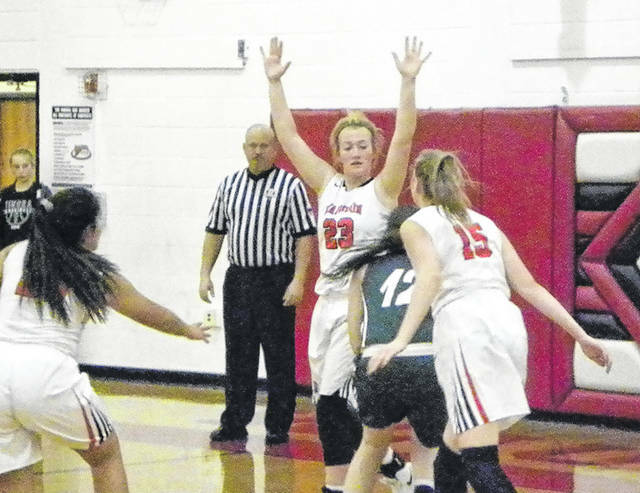 Wauseon found a hot shooter of their own in freshman Marisa Seiler. She closed the opening period, then opened the second, with treys to cut the Tinora lead to 19-16. The Rams held on to the lead until the final 2:43 of the half. In that final time, Seiler scored a putback and Sam Aeschliman was open on a kickout for a triple to put the Indians ahead 28-26 at the half. “We had our chances, we made some good shots,” coach Seiler said of keeping with Tinora after the opening period. The opening of the second half looked like the start of the game as Tinora’s Harris and Tristin Ackerman knocked down treys to put the Rams in front. Wauseon did recover, going on a 5-0 run to reclaim the lead at 33-32 with 4:14 left in the period. Tinora grabbed a 36-35 lead heading into the final period, but finished the third period by missing three free throws. The back-and-forth nature of the game continued into the final stanza. Both teams were successful from the charity stripe, and Wauseon was able to jump back in front when Seiler scored with the left hand and Aeschliman followed with a basket. Foul trouble was also beginning to add up for the Indians. Aeschliman and Sydney Zirkle both fouled out in the final five minutes, shortening the bench for Wauseon. With Tinora shooting in the double bonus, the final by Zirkle allowed Taylor Brown to tie the game for the Rams at 45 with 1:02 left. Wauseon took one final lead when Chelsie Raabe scored her only point of the night from the line with 39.5 seconds left. On the ensuing possession, Tinora worked the ball around and Harris came off a screen to bury her triple that turned into the game-winner. Tinora was 16 of 39 from the floor, with nine of the shots coming from long range. Wauseon finished 18 of 51 shooting. The Indians also committed 14 turnovers to 17 for Tinora. The Rams had a small 32-30 edge in rebounds. Zirkle led the Indians with 17 points in the contest. Seiler added 16. Wauseon (0-1) hosts Anthony Wayne Tuesday.